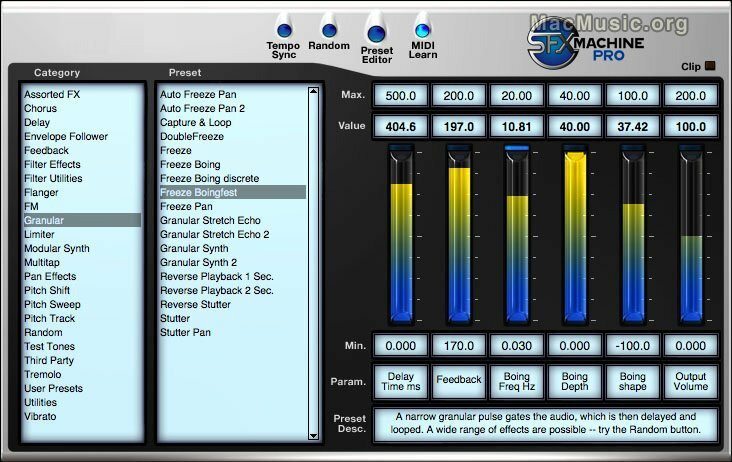 The Sound Guy has announced the release of SFX Machine Pro 1.0, an audio multi-effects plug-in for Mac. SFX Machine Pro is the latest entry in the SFX Machine family. It comes with over 300 effects, including more than 50 new effects. In addition, a Preset Editor provides access to the underlying modular synthesis engine, allowing users to create their own effects from scratch. The plug-in provides Tempo Sync, which matches LFO frequencies and delay times to the host sequencer's tempo, and it includes an output limiter, a new interface, and twice as much delay memory as SFX Machine RT. Automated parameter control is possible via a simple "MIDI Learn" interface, and a Randomize button allows quick experimentation. Jan 5, 2008 New updates for The Sound Guy, Inc. products.